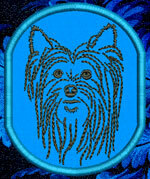 We created the 4" Medium Size Yorkshire Terrier Dog Portrait #1 Embroidery Patch for left chest placement on T-shirts, Polo Shirts and other garments. Also good fit for tote bags and other accessories. This product was added to our catalog on Wednesday 06 February, 2008.